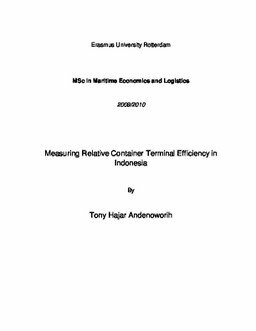 The main objective of the thesis is to measure efficiency of container terminals in Indonesia. The measurement has been performed by applying Data Envelopment Analysis (DEA), a non parametric approach. According to the study on DEA application in port sector, efficiency of container terminal is influenced by port size, port geographical, privatization and better incentive of production but the case occurred in Indonesia is different. Of the 12 container terminals observed, four of them present efficient terminals. Three out of four efficient terminals are not surprising because they are located in Jakarta, managed by private and serve international ships. But one of them, Pontianak container terminal is surprising because Pontianak container terminal is a small river port, serves small ship and operated by State-owned Company. The result is also surprising because TPS container terminal, the second biggest container terminal and managed by Dubai port, is not included as an efficient terminal. The phenomenon is theoretically difficult to explain. The only explanation may be the existence of any strong correlation between efficiency of container terminal and precision of strategic port planning.